Features changeable idle feed restriction and 4 emulsions for more agressive tuning. Enhance the performance for your main body with billet metering blocks. Machined from solid aluminum, they virtually eliminate porosity problems and will not warp. Features changeable idle feed restrictions with additional upgrades for racing applications. For Holley style carbs. There's no reason to still be using 1950's technology. Upgrade your carburetor with these Proform Billet Metering Blocks today! 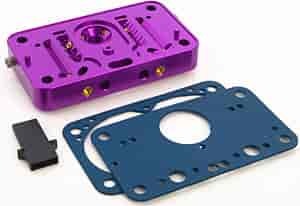 Will this work on the secondary side to make a four corner idle with the Proform vacuum secondary baseplate and carb body? No, not without some more modification to the main carb body.